Jose Maria Morelos. 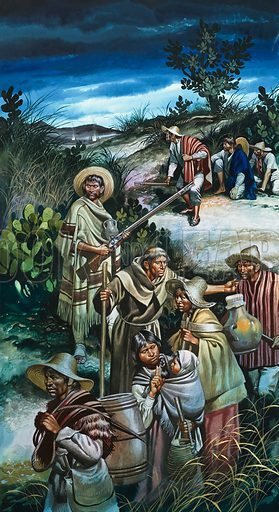 Morelos had held Cuautia for 62 grim days and nights against the Spaniards, but he was finally forced to evacuate the survivors. Quietly, he led them through the sleeping enemy lines. Original artwork for illustration on p24 of Look and Learn issue no 521 (8 January 1972). Lent for scanning by The Gallery of Illustration. Available worldwide for immediate download up to 2,954 x 5,417 pixels.